They say "Absolute Power, Corrupts Absolutely!" And, Massive authoritarian power with a radical ideology, can prove to be Periling. Donald Trump is a shrewd businessman, television personality, politician and now also the most powerful person in the world. After much global anticipation, Donald Trump was elected as the 45th President of the United States. “Buy American, Hire American!” was one of the key promises that got him elected and has understandably put many nations in a fix. Not only is Trump planning to bring production back home, he also plans to lower unemployment among Americans by emmigrating foreigner workers and restricting the H1B visas. A vast majority of the 85,000 general category H1B visas are fulfilled from developing countries and 70% of these issuances are from India. This is how thousands of talented Indian IT workers migrate to the United States and contribute to the American economy. The Indian government has been trying to prioritize the H-1B visas due to increased requests by its worried IT firms, however even they are limited by what they can do under the protective Trump administration. The US has traditionally been gravitating from being a manufacturing based economy to a service based economy. However, under Trump, this has begun to change. Trump’s campaign, ‘Make America Wealthy Again’ focuses on bringing everything that’s offshore, which includes production, manufacturing and servicing back to America again. Not only will this hit all the other countries that have American factories on their soil, it will affect every country that trades with America. It will result in a huge loss of jobs, particularly in third world economies such as Vietnam and Bangladesh. It will also make all these ‘American’ goods, more expensive for the other countries, which may result in a loss of trade for America, resulting in loss of jobs in America itself. While Trump claims that rebuilding America will create an estimated 13 million jobs, something that he has not substantiated with facts or data. Trump has also claimed that the real unemployment rate in America is 20%, rather than the 5.6% that has been published by government. "Against every 100 H1B visas issued, 183 jobs were created for the US citizens." 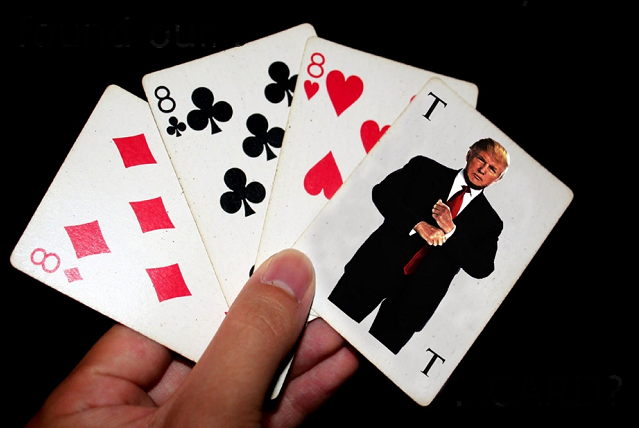 However, several of Trump’s initiatives have come under increased speculation due to his comments stating that these actions will ultimately boost the economy of the United States. His promise to re-negotiate trade deals brokered by America is still yet to be seen, meanwhile he has already pulled out of the Trans Pacific Partnership, temporarily banned entry of Muslim individuals from certain countries (currently inactive from a federal court ruling). He has used his power as President to enact certain measures that he would have been unable to do otherwise. 314 million Americans are going to be spectators to what Trump does in the future, on a first hand basis. What is still yet to be seen is how Trump is going to revitalize the economy, one of his promises throughout the campaign. Tech giants like Apple, Facebook, IBM and more have united to publically oppose such a move and even taken the Legal route, amid tensions of getting supply of green cards cut to half and raise the minimum compensation levels. 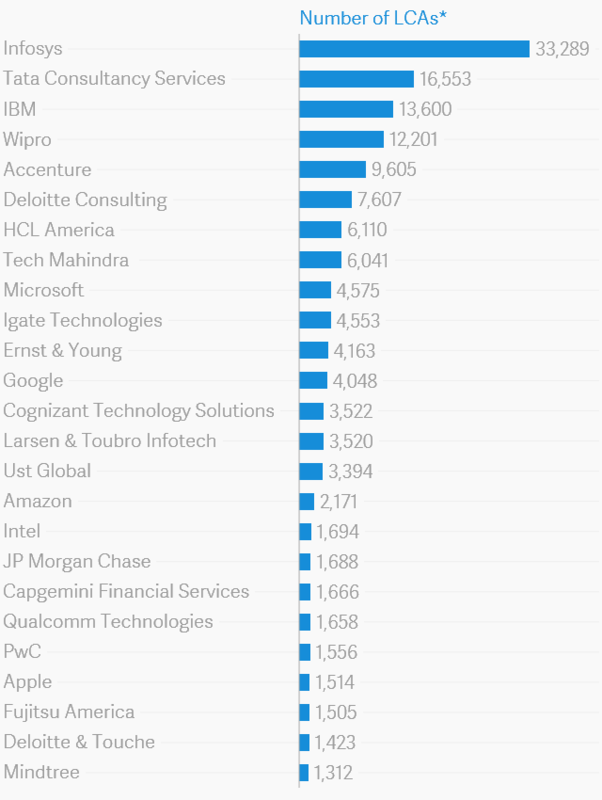 The hardest hit by the H-1B visas will be tech companies and various start-ups. Indian companies that have operations abroad in America and US companies that have a majority of their employees dependent on a H-1B visas have already started protesting the unfair and unnecessary removal of the H-1B visa, stating that it is crucial for the economy to flourish. 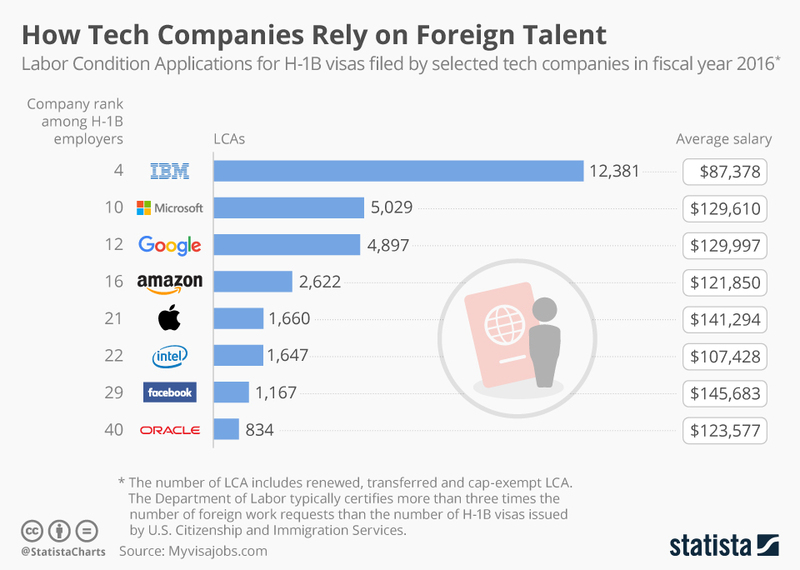 It is seen how heavily reliant the American firms are on these H1-B visas, it is the only access they have to top talent from abroad. By effectively disabling the H-1B visas, there will be a huge loss of jobs in America of foreign nationals, who will be forced to return to their own countries. While this will increase employment opportunities for Americans, the reason why these companies have not employed Americans initially is because of the lack of required skills. Many Americans are not qualified for the job positions that these H-1B visa holders are occupied for. Not only this, many MNCs such as Infosys and Tata Consultancy Services have already faced a dip in their stock prices (4%) amid concerns about the H-1B visas. Many of the H-1B visa holders contribute by creating thousands of jobs for Americans, something which will diminish once they are no longer in the picture.With such reforms, it is estimated that "About 70 percent of tech jobs may go unfilled in 2020"
A 2015 survey conducted by the Confederation of India revealed that the 100 Indian companies functioning in the US have created more than 91,000 jobs and investments worth $15.3 billion in the US economy. "Will America indeed be able to emerge as a ‘Wealthier’ nation, at the cost of Global Skill arbitrage?"